We've seen dozens(maybe a hundred?) of variations of sudoku. Cryptoku is the zaniest. It's a combination of Tetris and Sudoku. The white numbers are fixed - always the bottom row. As numbers fall, place them anywhere in the grid. If that number turns red, it's wrong. Green is correct. If the number turns orange, then the correct number is either 1 higher or 1 lower. That's for the basic levels. Harder level: as the numbers fall, they increase in value. Look at the orange arrow. It's pointing to a Temporary number. It will fade away after about 10 seconds. 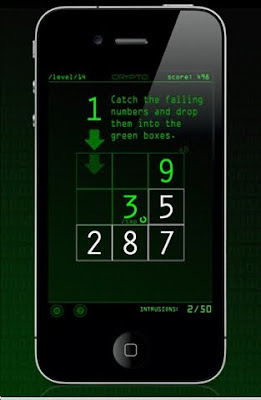 Crytoku has 50 levels. I'm on level 20 right now. 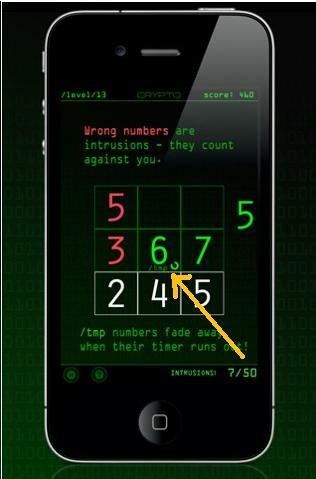 One of the bottom numbers alternates between two numbers. Let's say the space alternates between 5 & 8. It's crazy! And fun!